Two generations of Hollywood 'golden boys' team up in Tony Scott's Spy Game, a neatly plotted espionage thriller. 127 min. Universal Pictures. Director: Tony Scott. Cast: Robert Redford, Brad Pitt, Catherine McCormack, Stephen Dillane, Larry Bryggman. 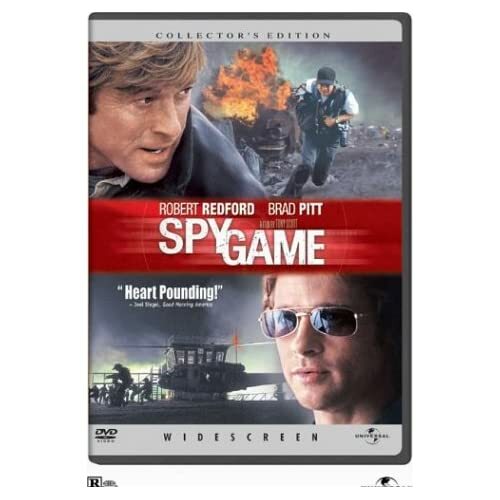 Two generations of Hollywood "golden boys" team up in Tony Scott's Spy Game, a neatly plotted espionage thriller. Robert Redford plays mentor to Brad Pitt, and the "art imitates life" message is implicit, that the film captures the frozen moment of a hand-off: one star grasping the baton with another. When an unauthorized extraction mission in China goes horribly awry, CIA agent Tom Bishop (Pitt) is imprisoned and scheduled for execution if, as expected, the U.S. government disavows him. Meanwhile, at the CIA's Langley campus, Nathan Muir (Redford)—the man who taught Tom everything he knows—gets wind of the crisis. The only problem: Muir has been shown the door, and he's hours from retirement. Swiftly and skillfully making himself invaluable to the situation briefing, Muir positions himself to help Tom in any way he can. As the minutes tick away, Muir recalls his mentorship of Bishop—a.k.a. "Boy Scout." The flashback episodes offer bite-size bits of colorful CIA mythology, in Vietnam, East Germany, and Beirut. Together, they form something of an arc, illustrating the difficulty of a sacrificial life spent in service of the Agency. Though Nathan warns him against her, Tom falls for Elizabeth Hadley (Catherine McCormack), a femme fatale of sorts with secrets of her own. The entanglement of Tom and Elizabeth becomes further complicated by the interventions of Muir, who ruminates on his own role in the present-day mess it has spawned. Necessary though they are, the flashbacks feel unfortunately perfunctory (despite the presence, in one, of Charlotte Rampling) in their dramatic beats. The real tension resides in the present, with Muir persistently, precociously breaking the rules of the game. His figurative chess match with superiors played by Larry Bruggman and Stephen Dillane (with assists to Muir from executive assistant Gladys, played by Marianne Jean-Baptiste, and our-man-in-Hong Kong David Hemmings) is the most entertaining portion of the film. Part of the problem is that the headlining stars strike an imbalance. Pitt, while not bad, languishes with a generic character, while Redford is allowed to give a sly performance redolent of years of hard-earned wisdom. "When did Noah build the ark, Gladys?" he asks. "Before the rain," he answers. 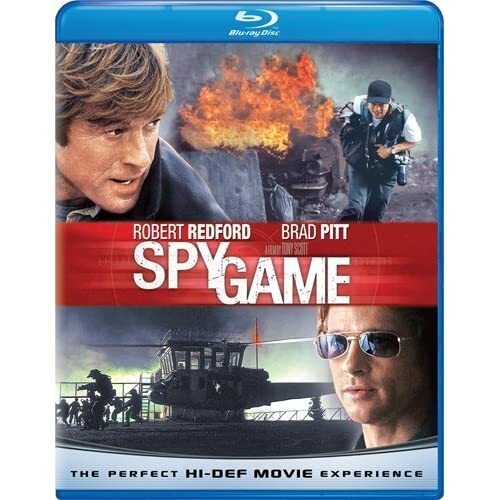 Spy Game makes its Blu-ray debut in a lackluster transfer that tops DVD but doesn't meet the usual Universal standard. For that, Universal will have to drop the old 2002 hi-def transfer and create a new one that avoids the pitfalls of conspicuous edge enhancement, Digital Noise Reduction and, ironically, digital noise. Again, the Blu-ray is an improvement over standard definition, and even praiseworthy in some areas (primarily color and contrast), so complaints are picky, but telltale signs of dirt suggest this not-so-old film deserves better in the PQ department. The DTS-HD Master Audio 5.1 mix, on the other hand, offers strong lossless audio that doesn't disappoint in the least in its immersion and clarity. The DVD bonus features are ported ocver to BD, beginning with a feature commentary with director Tony Scott and a feature commentary with producers Marc Abraham and Douglas Wick. Clandestine Ops is an interactive feature available during playback of the film. Select the pop-icon, and you'll be taken "behind the scenes and given exclusive information on the making of Spy Game." Also by way of a pop-up icon, one can access the alternate version of a scene just after the theatrical version plays out. Five "Deleted Scenes" (5:26 with "Play All" option, SD) and four "Alternate Versions of Existing Scenes" (14:17 with "Play All" option, SD) come with optional commentary by Scott. "Script-to-Storyboard Process Featuring Director Tony Scott" (2:51, SD) displays some comparisons, as explained by Scott. Requirements for CIA Acceptance is a text-based feature laying out a list sourced from the CIA. Lastly, Universal includes its customary My Scenes and BD-Live options. All site content © 2000-2019 Peter Canavese. Page generated at 04/17/2019 04:48:30PM.